Preheat the oven to 350°F. Place the Nature Valley granola bars in a food processor and process to a coarse crumb consistency. In a large mixing bowl, add the granola bar crumbs, flour, brown sugar and melted butter and stir to mix together. Spread the mixture out onto a pan lined with parchment paper and bake for 20 minutes, stirring occasionally. Let cool completely. 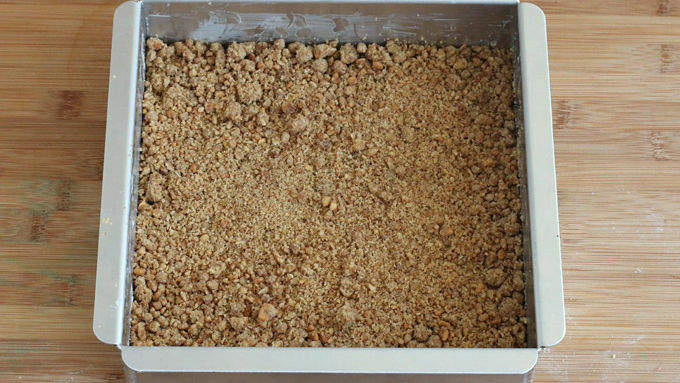 Spread half of the crumb mixture onto the bottom of an 8x8-inch baking dish. Reserve the other half of the crumbs. In a large mixing bowl, add the softened ice cream and stir in the apple pie pieces and caramel sauce. 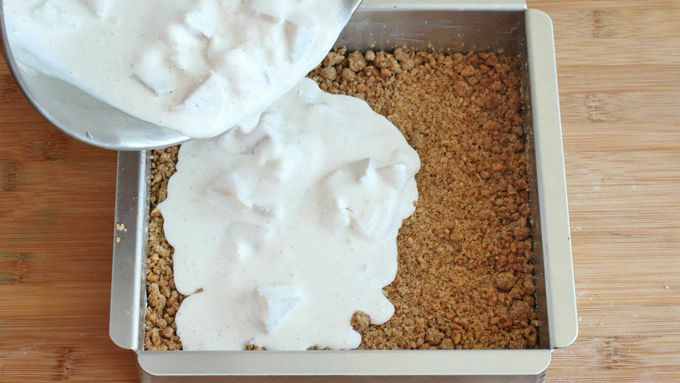 Pour the mixture over the crumbs in the 8x8-inch baking dish. Sprinkle the remaining crumbs over the top, cover with aluminum foil and freeze for at least 3 hours. Cut into squares and serve with whipped cream and caramel sauce. 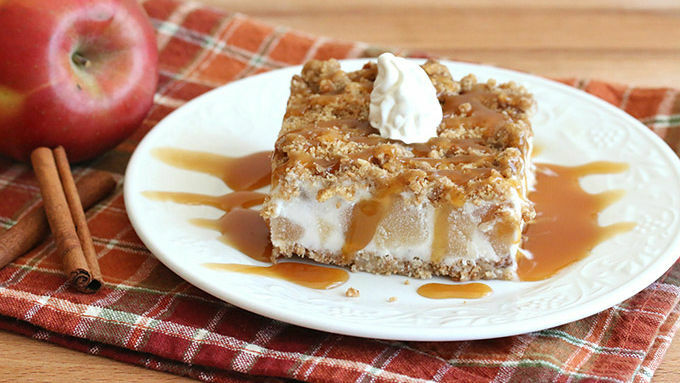 A frozen crunch cake with sweet apple pie flavors and plenty of caramel sauce to cure your dessert cravings. Who doesn't love a good apple pie and ice cream? I almost always have a frozen apple pie on hand for when I need a spontaneous dessert. But ... I don't always have the ice cream when I need it. I know it's cliché, but it happens all too often. You pull out an apple pie, only to realize you don't have any vanilla ice cream. (And you can't serve apple pie without ice cream. You just can't.) So you throw your head back, let out a deep groan, toss the pie back in the freezer and wonder what you're going to serve for dessert. Well, here's a dessert you can prepare up to a few days in advance. The ice cream is already incorporated, so you don't have to worry about having it on hand. It's like a caramel Dutch apple pie and ice cream all in one! 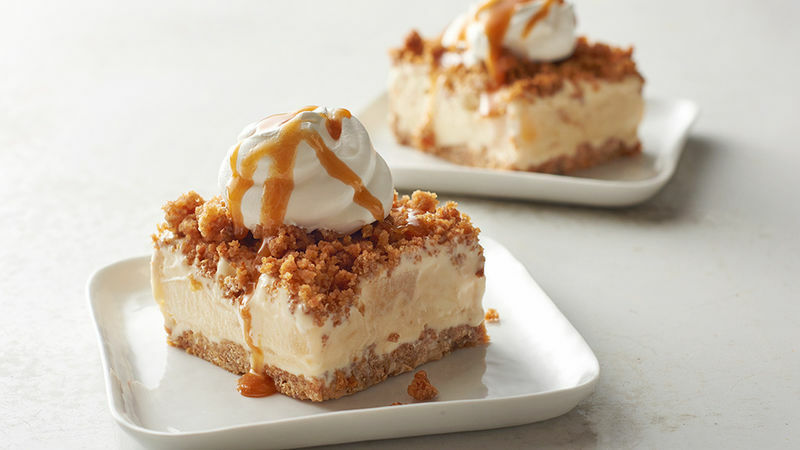 These frozen dessert squares have a crunchy granola top and bottom with a creamy layer of ice cream, mixed with apple pie filling and laced with gooey caramel. They're easy to make, can be prepared in advance, and thoroughly deeeelicious! Serve these squares with a dollop of whipped cream and an extra drizzle or two of caramel sauce and your guests will be positively delighted. Cut into squares and serve. It’s delicious plain or with whipped cream and a drizzle of caramel sauce.